Of Course you can Fly. I designed this card for a workshop later this year at Martells. I had no idea where I was going with it when I started putting it together but I was so pleased with the end result. I made the background using the wet smooshing technique with Distress Inks and overstamped some tiny birds with Black Archival, they were 2nd and 3rd generation stamping. The birdcage was cut using a Spellbinder Die. When I decided where I wanted it to go, I stamped a bird to fit in the cage and a branch for it to hang from. The larger bird is also a die from the same set as the cage and I wanted him looking in at the other bird. I stamped a swirl in the bottom corner and added some black seam binding and a dazzler. The message was stamped on the same background then stuck on with 3d foam pads. 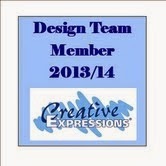 All of the items used were from Creative Expressions..visit their website for product details. There's loads on there including their own blog. I spent a merry few hours playing with some gilding flakes yesterday. When I'd finished the studio looked like an explosion in a fairy factory and so did I. I'll take a piccie of the finished piece and you can let me know what you think. Anyhoo, samples to make for Ally Pally today so better get on with it. Thanks for visiting and any comments are always lovely to see. You do sometimes wonder if there's anyone reading this! One last thing.....please remember the blog candy!